Catching the Peloton, or, Who Are Those Guys?? 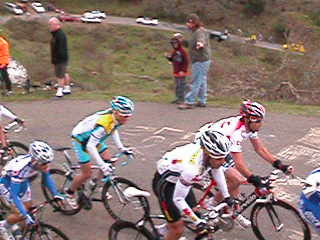 Last week we went over to Sebastopol and watched Stage I of the Tour of California. We’ve been there every year for the last three years, and this was the second year we climbed halfway up Coleman Valley Road and watched the peloton snake its way up toward us. I’ve got some GREAT video, but my stills aren’t the best. Oh well — every year I learn something new about photographing the race; maybe someday I’ll get something good enough to share. Either way, I’m happy because I got to see the guys in person and I’ve got pictures to prove it. Work started up again this week, and I’ve got to say I’m glad, although it may be tough getting back into the routine again. Oh, wait — I forgot. I never really HAD a routine, which was part of my problem. Seriously, one of these days I’ve got to make up a work schedule and make myself stick to it. You know, so I’ll be able to work and still have a life . . . I finished up my “quickie” knitting project — took time off from the Pinwheel Sweater to knit up a hat, with the intention of giving it to my mom. Last summer I bought two skeins of Cascade 220 in a lavender shade which I thought she might really like. I wanted to knit her a warm scarf, maybe the Wavy, for a Christmas gift. But I never got round to actually doing it, and now of course the weather’s warming up. So then I got my “brilliant” hat idea — more on that later, perhaps — and decided to kick things off by knitting a pinwheel-style hat. I chose to use one skein of this Cascade 220, hoping that my mom would like it and if not, I figured I’d keep it for myself (I never used to like pink in any shade, but lately my intense loathing for it has been on the decline for some strange reason). Finished it up last night and took it over to show her today, and she really liked it a lot! Except for one thing: the color. Oops! I was surprised because I was SURE this was the perfect color for her, but whatever. I asked her what color she would prefer, and she suggested white. And that’s fine, because I’ve got two balls of some beautiful cashmere blend in Ecru that I bought months ago on a pure impulse, absolutely no idea what I was going to do with it. Now I know! 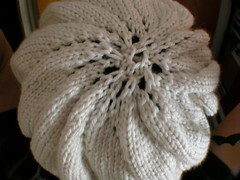 Here’s a photo of the hat I ended up knitting for my mom. She loves it! This year’s still photography theme was quantity, not quality. I’ve got over 200 images, and if I made them into a flip book I’d have myself a little bitty movie. Yes, tiny, tiny little photos with not enough pixels. They look okay, but I can’t tell who I’m looking at! Next year I’ll get better shots. I promise. Pingback: Pages tagged "happy for no reason"
Next PostNext What a way to wake up!